Anna King sang with the James Brown Review in the mid sixties. In 1964 James Brown produced an album with her called Back to Soul issued on Smash in the USA. It was issued in the UK on Phillips records, it was a notable album release, though it enjoyed modest sales to the avid soul fans of the day, consequently it has long been a rare collectors' item. She was backed by James Brown on organ and musicians from the Famous Flames. 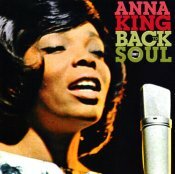 This is the first time it has been issued on CD, the album includes Anna King's distinctive versions of several soul and blues hits and some James Brown originals written under various pseudonyms, Jim Jam and T. Wright. The last track is a storming duet with Bobby Byrd, 'Baby Baby Baby'. Issued by Cherry Red Records on Shout 24.